Weather can get pretty rough here on Earth, but there’s a rocky exoplanet located about 40 light-years away that features some of the most extreme temperature fluctuations ever seen by astronomers—reaching temperatures so high that lava flows directly on the surface. Now, in another first, astronomers have compiled a weather map for this super-Earth, revealing its extreme meteorological and surface conditions. The results of this study now appears in Nature. The new thermal map, compiled by astronomer Brice-Olivier Demory and his team from Cavendish Laboratory in the UK, shows that the planet is very hot as a whole, but it experiences dramatic temperature differences between its dayside and nightside. Like our moon, 55 Cancri e is tidally locked, which means its dayside surface is always facing the sun. 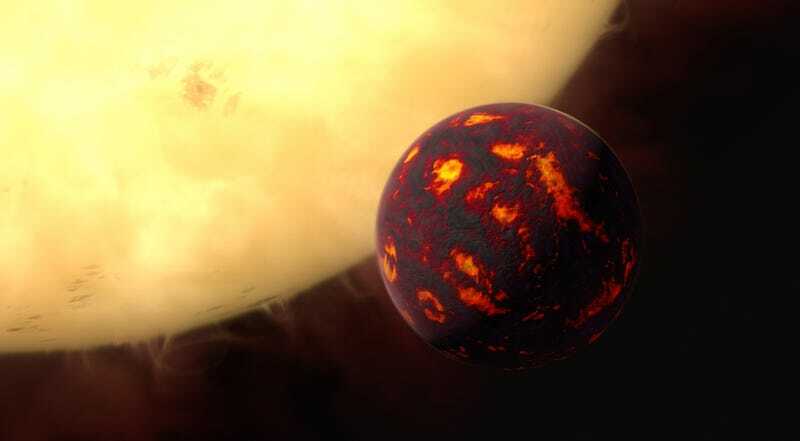 It’s very likely, therefore, that this super-Earth experiences geological processes—such as high winds, lava flows, and volcanism—similar to what’s found in our own solar system. Using the Spitzer Space Telescope Infrared Array Camera, the researchers found that the planet’s nightside temperature is around 1,107 degrees Celsius, while its dayside temperature is about 2,427 degrees Celsius. That’s a dayside/nightside difference of a stunning 1,027 degrees Celsius. Such large fluctuations produce some rather bizarre conditions on the surface. The researchers detected a peculiar hot spot on the surface at 41 degrees east from the substellar point (the point at which the sun is directly overhead), leading to two very different explanations. One possibility is that the planet has a thick atmosphere that’s producing strong, hot winds exclusively on its dayside. But for this hypothesis to work, the atmosphere would have to be dominated by reflective high-temperature vapors like silicates, and a nightside that drops to below freezing so that gases can condense. But looking at the temperature data, this scenario seems unlikely. Alternatively, the hotspot can be explained by molten lava on the surface of the planet’s dayside. At a temperature of 2,427 Celsius, silicate-based rocks (which are common on 55 Cancri e) can be quite viscous, so this melted rock is probably flowing like water does at room temperature. As for the nightside, the silicate rock would remain cool enough to sustain a surface that’s partially to mostly solid surface. The planet’s tidally locked nature and orbital velocity is insufficient to explain these extreme temperatures, suggesting that some other source of heat is being generated within the planet. It appears that this remarkable exoplanet—one of the first to ever be discovered—still has many secrets to tell.